Ergonomically designed, this large 2 shelved floor trolley with reacher holder is a must for transporting a portable ceiling hoist unit from room to room in an institutional environment. 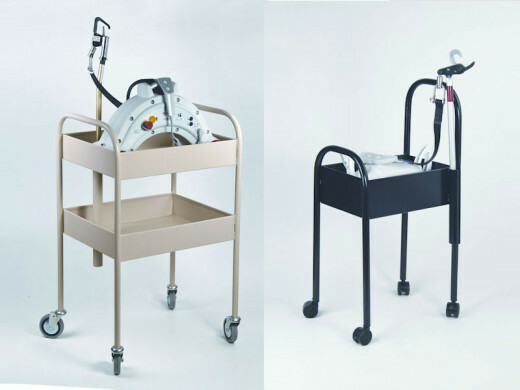 Designed in conjunction OH & S coordinators and occupational therapists to prevent potential back injuries, the large floor trolley glides along on full size, non-marking rubber castors. The bottom shelf is ideal for sling storage. Suits all CHS portable hoists. Designed specifically for home use, this compact little trolley makes transporting a portable hoist around the house a breeze. Comes with a reacher holder and single shelf.